With threats of Tropical Storm Beryl ruining a perfectly lovely Memorial Day weekend in and around our area of the nation, Harley (without a lick of effort) convinced me to take a trip with him to Charleston, South Carolina to get away from the storms and enjoy a little bike riding in a more bike-friendly city. Though some predicted Charleston would more likely receive the brunt of the storm than our city, we decided to go with our gut. The Doppler was certainly indicating that Beryl was headed straight for Jacksonville and Savannah, so Charleston-bound we were, and boy were we fortunate enough to go with our gut. Charleston had itself a dream of a weekend! Granted, our first night there was a bit of a nightmare. On this very weekend, Charleston was hosting what I dubbed as the Olympics of Art Festivals, Spoleto, unbeknownst to us, that is, until we were trying so desperately to find a place to lay our heads that night. Every hotel we called, we received a “LOL, are you serious?” after asking if they had any vacancies that night. We figured we’d just drive up right into the city, Saturday evening, and just call up one of the local hotels for a 2-night stay. No dice. Not even close. The clock was ebbing closer and closer to 10pm, we googled all the hotels in and around the Charleston area, including surrounding cities, and ended up going with the Motel 6 in a city about a half grillion miles out. I’m not going to elaborate on our night at the Motel 6. All I can say is “NEVER again.”. At our age, motels such as that are not supposed to be utilized while you’re on vacation. In my world, they’re only meant for last minute, money-saving times when you’re too tired to give a damn. Needless to say, we choked down our disgust and chased it with a popular beer to the region, Fat Tire, that just so happened to have a bicycle on the label. It was actually pretty tasty and I decided to make that my beer of choice for the remainder of the trip since it’s pretty hard to find in Jacksonville. And no, not because it had a bicycle on the label. Well… at least not entirely. Morning came-to about as slowly as our sobriety and we hightailed it out of there. Mentally going down the list of the hundreds of hotels we called the night prior, Harley remembered a Bed & Breakfast in a town right next to Charleston, called Summerville, that was fairly priced and vacant for Sunday night. He called ’em up and sure enough that little B&B, Flowertown, was all ready for us. We got a bite to eat and drove straight there and it was everything we had hoped for and more. 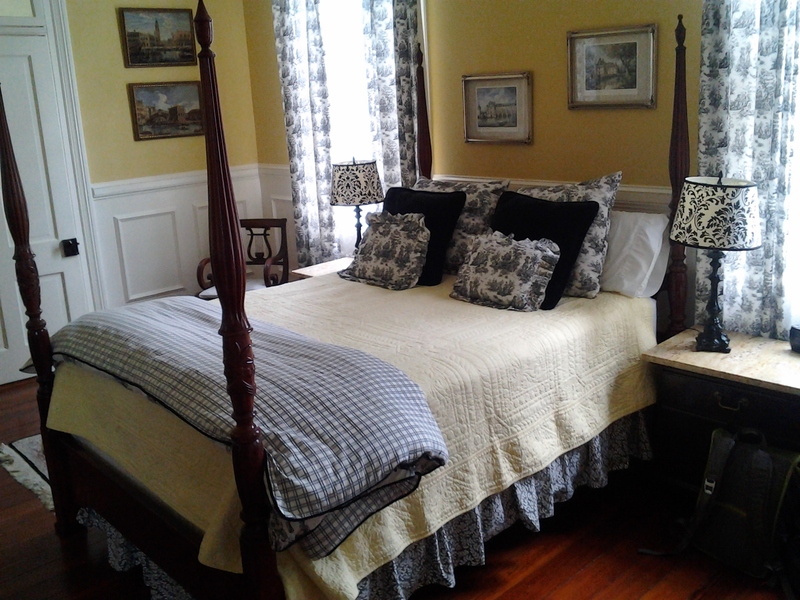 We practically had the entire house to ourselves, it was gorgeous beyond belief, both home and garden area, and we stayed in the most beautiful little French country-esque room. What a relief! I “Get hit by cars in” FL… But not so much in SC. 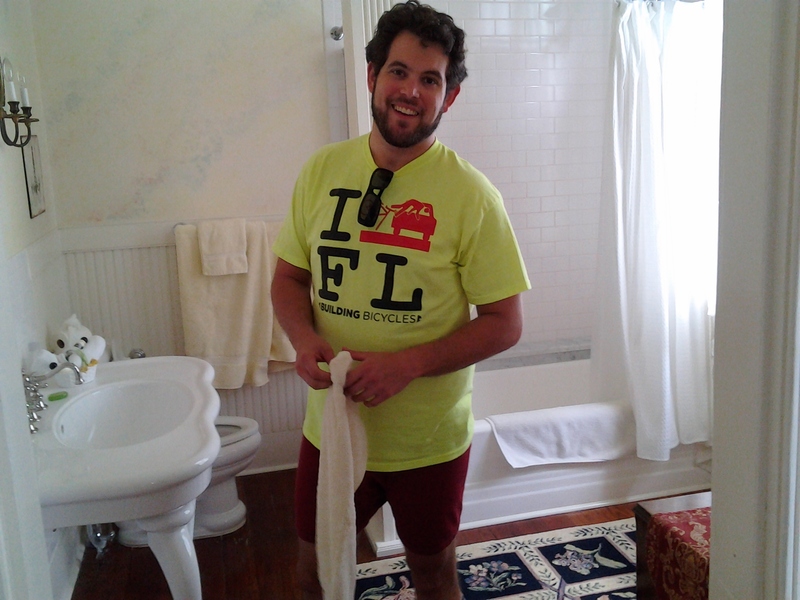 After freshening up and washing off the trials and tribulations of the night before, we packed our car with just the bare essentials – fanny pac, sunscreen, spare tubes and basic tools, and of course, 2 bikes – and off we drove to beautiful Charleston. We parked on a residential street, took out our bikes, and noticed that I’d forgotten a bike lock. So our first stop was to find a bike shop and buy a lock. We came across a place called The Bicycle Shoppe of Charleston and just as I walked out of the place, Harley and I were approached by a guy, Rob, who recognized us from the Duval Dirty Bike Olympics event that took place here in Jacksonville last March. 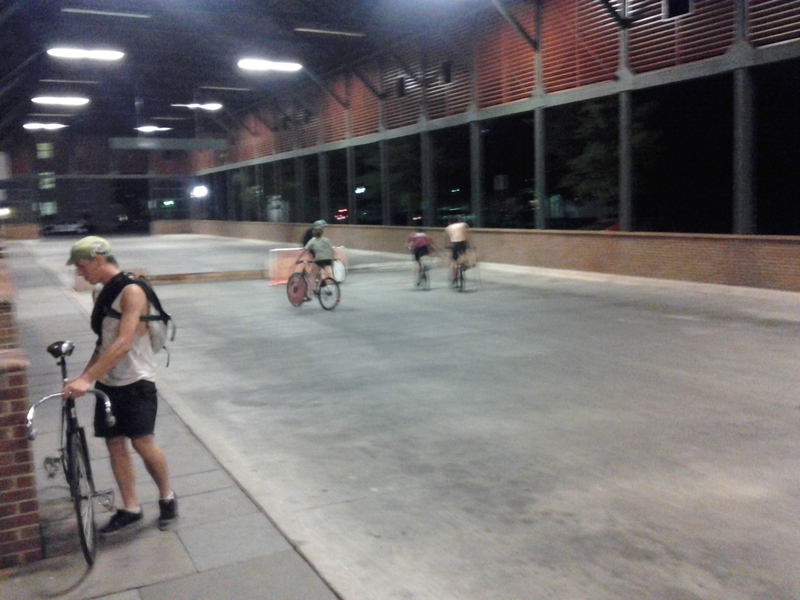 He told us a few goings-on in the area and also told us to hit up the bike polo game taking place that night in an old bus station garage. We were thrilled that we ran into someone we knew and that he was able to direct us to other cyclists in the area! So we continued our day on our bikes, riding all around the urban core, an area much much larger than Jacksonville’s. We visited the history museum, a few parks, some bars and restaurants, the outdoor market, and we also paid a visit to the Not So Hostel, also located in the urban core. We’re fascinated with the idea of running a bike-friendly hostel, so we were very eager to check this place out and talk to the owner or manager about it. It was a typical-to-Charleston, two-story home, with several private bedrooms and a big room for the dorms. 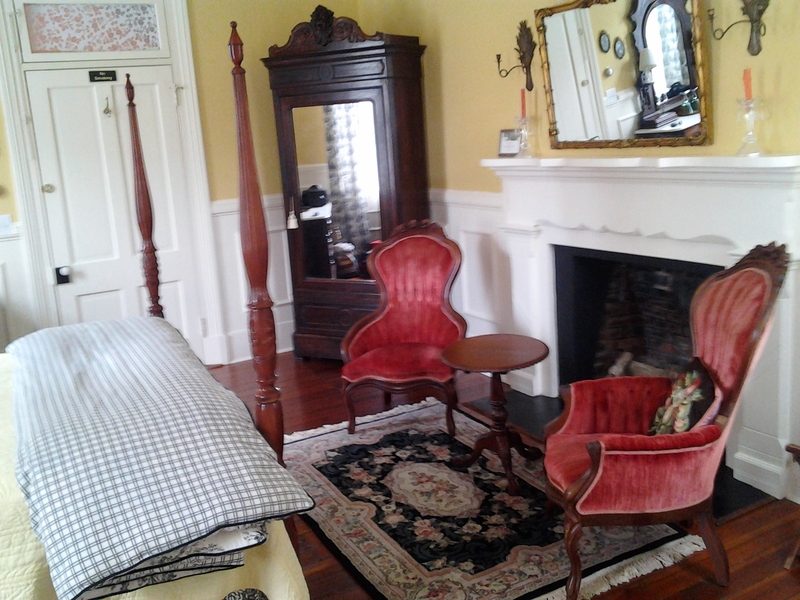 They also had a couple common areas, a kitchen, and a few porches for lounging and leisure time. In the back is where they keep their rental bikes, the most perfect way to get around this town, especially if you’re a visitor. We spoke with one of the ladies in charge and she mentioned that Charleston, although a great town to bike in, has its fair share of squashed bicycle advocacy efforts. As Harley and I soaked in the scenery, we noticed that just about everywhere we turned, there was a bike in our sights. No kidding! 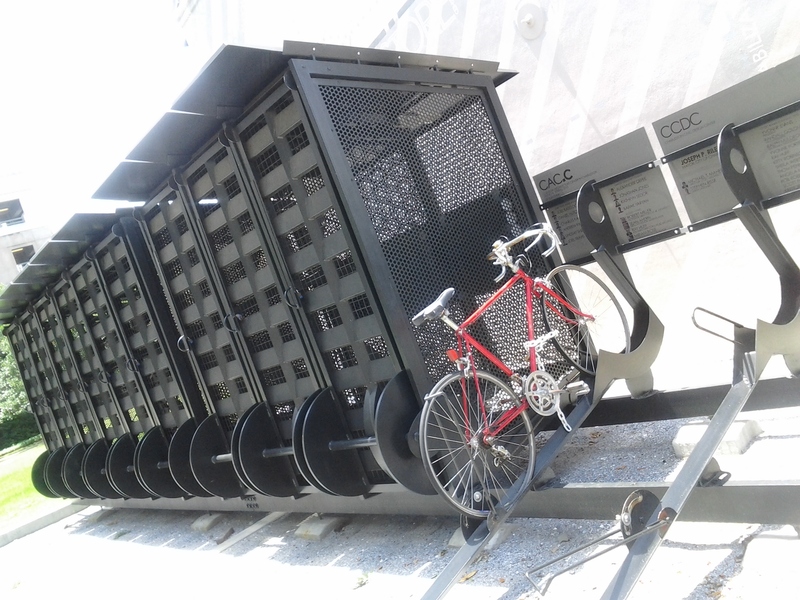 There was either someone riding a bike, or several bikes locked up onto fences, posts, and other make-shift bike racks, as well as the occasional actual bike rack. And rarely did we see anyone riding on the sidewalk. 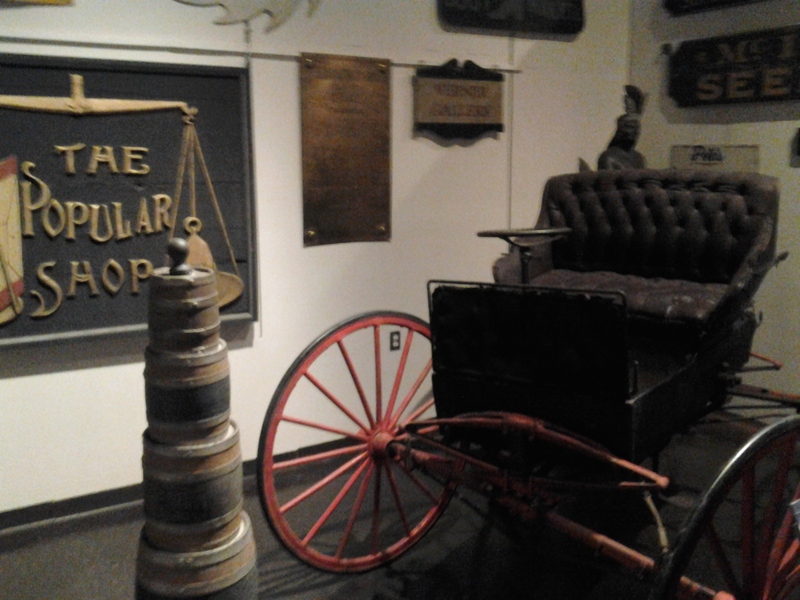 Another rare thing we experienced was impatient, begrudged motorists who didn’t understand what the 3-foot law was. We saw some bike lanes and sharrows, but for the most part there wasn’t much infrastructure, likely because the old streets are too narrow. Luckily, however, as I always say, all the paint in the world isn’t going to save you from ignorant, pissed off, or negligent drivers. Harley and I hadn’t a care in the world while riding theses streets. Cars and bikes just simply got along, sharing and caring and caring and sharing. What a concept, eh?! 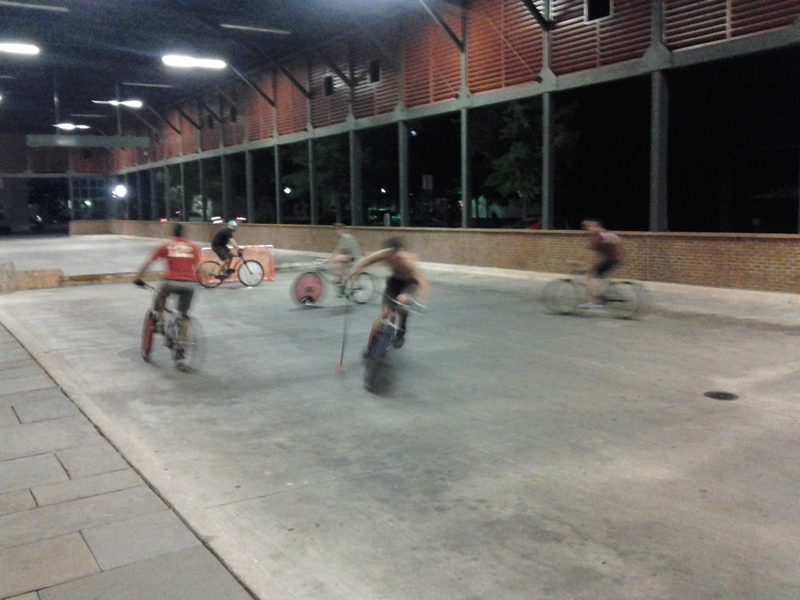 Later that night, at about 8:00pm, we went to the old bus station to watch some sheltered bike polo. We ran into a couple more folks that attended the Duval Bike Olympics and we chatted up about bike culture, comparing and contrasting our cities for better or worse. It was very interesting to get a first-hand look at the bike culture here. Though the bike hostel lady admitted the city still needs to progress with painting bike lanes and so on, the fact that the motorists seem to embrace cyclists makes me feel a helluvalot better about there not being very many bike lanes. Paint on the road isn’t going to keep you as safe as a culture filled with what seemed to be educated, tolerant, and patient motorists. The following Monday, we awoke to our beautiful little B&B room, ate some breakfast, loaded up the car, and headed back out to Charleston to enjoy the remainder of our mini vacation in one of the more bike-friendly cities of my travels. Just like the weekend, Monday was no exception for the large amount of bikes we saw in the urban core. And no shortage of patient motorists either. Our conclusion: Charleston likes bikes. Jacksonville… not so much. Can ya tell I’ve grown a little jaded about advocating in the third most dangerous city in the nation and what seems to be the most dangerous state in the union? 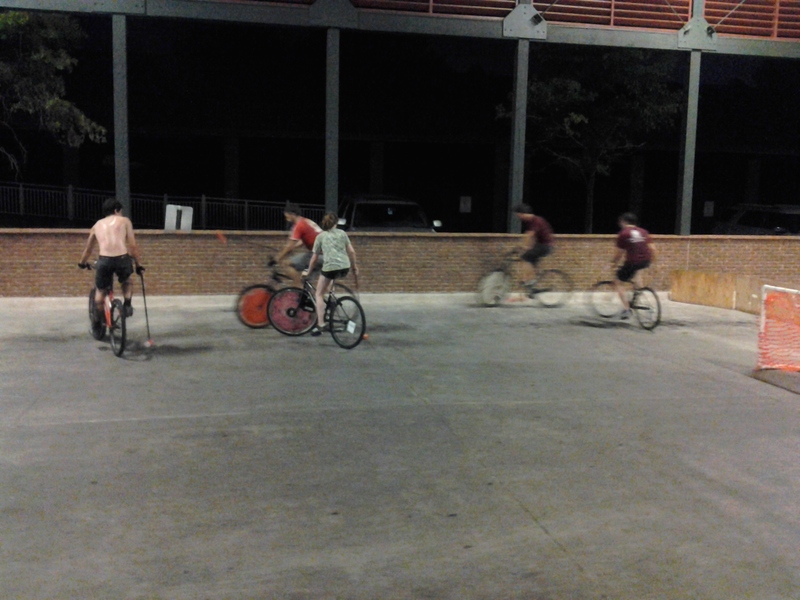 Bike Polo is alive and well in Charleston, SC. There’s Roberto Puig, just about all mended up from breaking his arm at the Duval Dirty Bike Olympics back in March.